Pizza. I can honestly say I’d never really tasted REALLY GOOD pizza until I went to UK. I know now that pizza isn’t the fast food variety…well, ideally it shouldn’t be. It’s like telling me we should sell crème brûlée in little styrofoam cups. And then, completely by chance, I heard of something called deep dish pizza just recently. I was in the US in the second week of October 2011 and had about 7-9 hours to while my time away in Chicago before my flight back to Dubai. 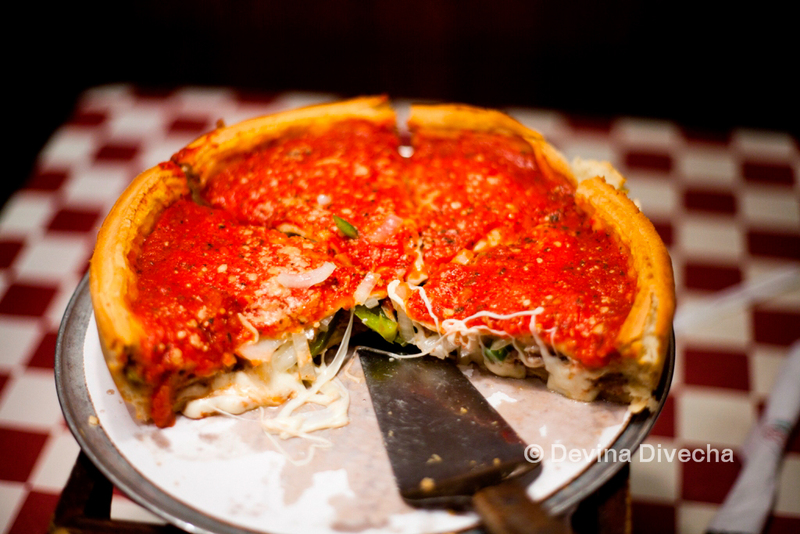 My newfound friend and fellow journalist, Angela (who was content to let me photograph everything to death, bless her), said she wanted to try Chicago’s famous deep dish pizza from Giordano’s…she absolutely had to. I’m ashamed to say I’d never heard of it before. To me, Giordano’s equated to clothes. By the time we got to Chicago (from Kohler, Wisconsin…takes between 2-3 hours depending on traffic), we were hungry. It didn’t help that once we got to the Chicago Union Station, we had to lug our luggage across streets undergoing roadworks and a flight of stairs (we clearly did not find the main entrance, now did we?!) before finally reaching the lockers where we had planned to store our bags before jetting off on soon-to-be-had Chicago adventures. All this took far too long, so we were really famished at the end of it. Oh yeah…and we were planning to find our way across Chicago (picture Dubai Marina with Karama’s sense of hustle and bustle but with skyscrapers – yes more than what the Marina has) without Google Maps. We didn’t have a data plan between us. We were relying on print outs. As Angela would say, ROCK AND ROLL! Hey we have a Potbelly in Dubai too!, I squealed. 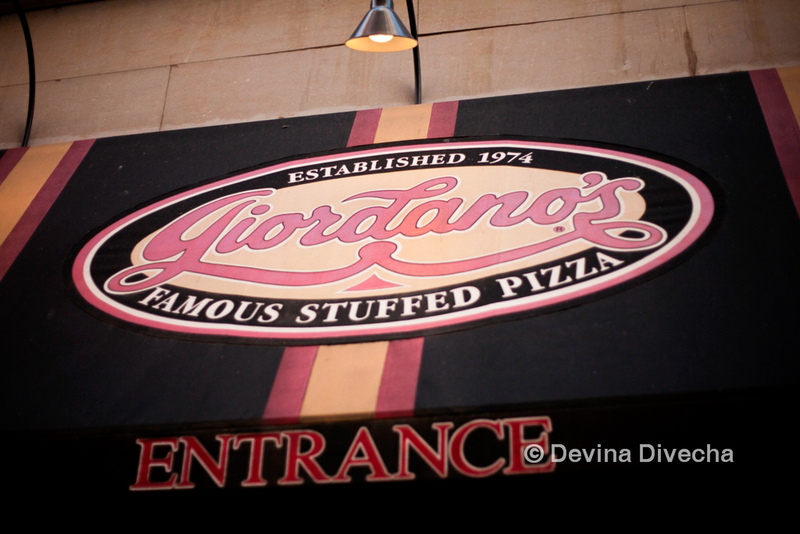 …we finally stopped in a nail bar (yes really) and asked them where Giordano’s was. He clearly thought we were bonkers because we’d apparently passed it not two blocks back (I now know what Americans mean by blocks. I spent the entire trip puzzling over what kind of measurement a ‘block’ was, until now…thanks for explaining Angela!). When we entered, we were led into a booth that made me think of what I’d seen in American movies and Archie comics. Rookie mistake: We ordered a dip. Now, now don’t get me wrong. That spinach artichoke dip was awesome. But you’ll see in a bit why it was a colossal error. Anyway…while waiting for our pizza (we ordered the Special), we got ourselves root beer – apart from the dip. Oh, deep dish pizzas take 45 minutes to make, so be prepared to wait for the awesomeness. And then … it arrived!!! Angela and I looked at it. It was big. Massive. Round. Oh my goodness, how were we going to finish this? We deposited a massive slice onto our plates and started digging in. Now this…THIS… was a pizza. Filled with cheese, cheese and MORE CHEESE (along with sausage, mushrooms, green peppers and onions), the sauce was just wowing my taste buds, egging me on. EAT MEEEE! it screamed. I obliged. Happily. Now, herein lay the sad tale: we were so stuffed, we couldn’t finish. I know you’re wondering how I could do something like that…I mean, LOOK AT THE CHEESY GOODNESS RIGHT THERE! And because we were travelling, we couldn’t pack the remaining two slices to take with us. I turned my face to the two lonely, sad, chubby, deep dish pizza slices and apologized. Yes. I said sorry to the pizza. They needed to know why we were letting them go. “I’m sorry,” I said, near tears, to them. “It wasn’t meant to end this way…I meant to make you mine,” I whispered quietly. I explained best I could and left quickly (after paying, natch) before they could persuade me to somehow rescue them from their dish and take them to their rightful home: my stomach. Giordano’s, I pledge my deep dish pizza troth to thee. 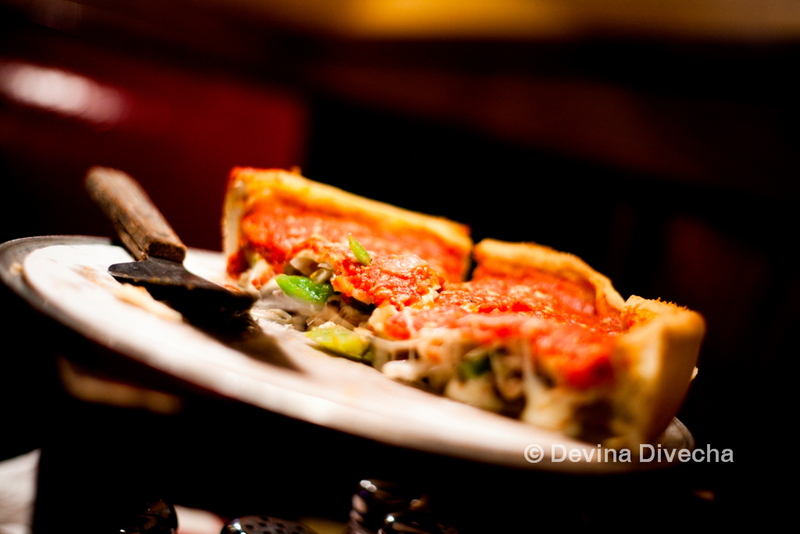 If you’ve ever had deep dish pizza, tell me what you thought! Also, where do you get your pizza fix from? Glad you loved the pizza! I used to work just around the corner from the Giordano’s you visited. The pizza is great for deep dish but I’m a thin crust kind of gal. We usually box up any leftovers and give it to the homeless on the street. @dinamurali I don’t know. Maybe @foodivaworld knows? Yeah this place was really cool. It’s definitely an institution from what I can tell.Awwww thanks *blush* You’re pretty awesome too.